Great "Go Go's" alike powerpop! They band was from L.A./California (maybe?). This was a 12" release but the title song was also released as a 7" on a sub-label of Bomp records. I haven't found more informations. I notice you've got the cortina's LP - well worth the pennies!! - have you noticed "the pigs" LP is out soon on Bristol Archives. BTW I'm listening to the signals as I'm writing this & they're not bad! Heartbreak is a great great song!!!!! I don't know this band. Thanks a lot from Spain!!!!!! I have known the Signals sincle they began. Loretta Grikavicius is the leader of the group. They are from LA, California. They are on the Rodney on the Rock Volumne 3 album also. 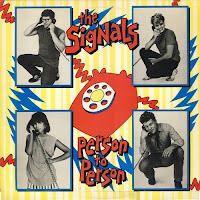 PLEASE CHECK OUT MY SIGNALS FAN PAGE ON FACEBOOK. MY SITE CONTAINS RARE PHOTOS AND VIDEOS. YOU CAN LOOK ON MY MARK ANTHONY SIMMONS FACEBOOK PAGE AND THERE YOU WILL FIND MY SIGNALS TRIBUTE. Please please...could you reUp this one!! Hey there great music by my sister Loretta. what a talent and what great tunes,awsome I am so proud of her! Keep on ROCKIN!!!!!! Love you mucho.